Treatment of Municipal Solid Waste (MSW) becomes an increasing problem worldwide; however, MSW contains high lignocellulosic content that can be further processed for the generation of electricity, transportation fuel and other commercially important products. This study aims to explore the possibility of hydrolyzing MSW into a sugar solution, which could then be fermented into liquid biofuels, such as bioethanol. Two commercial cellulase enzymes, Cellic® CTec2, and a fresh prepared fungal filtrate were used to hydrolyse MSW. Results revealed that CTec2 displayed the best hydrolysis efficiency. Use of an alkali pre-treatment on MSW before enzymatic hydrolysis failed to show any improvement in terms of release of sugars, an assessment of the efficacy of addition of surfactants revealed that addition of tween 80 or polyethylglycol had a no significant effect on release of sugars. Results revealed that by increasing the solid liquid ratio the amount of glucose increased, Data generated by this study was analysed using design expert stat program. The most abundant lignocellulosic raw materials are grass or residues from the agricultural industry. However, MSW can be derived from other raw materials such as recycled paper from offices . MSW has emerged as an attractive option because of lower feedstock costs and higher potential for displacing the use of fossil fuels with a concurrent reduction in greenhouse gas emissions . MSW consists of cellulose; hemicellulose which are tightly bonded to lignin via hydrogen or covalent bonding . To access the sugars, biological, acid and alkaline pre-treatments are required which convert cellulose and hemicellulose into available monomeric sugars . A biological process makes use of enzymes as bio-catalysts for the breakdown of cellulose into monomeric sugars, use of enzymes speeds up the liberation of monomeric sugars but has drawbacks in terms of time and cost . Despite this the conversion of cellulosic biomass to sugars which can be further converted into fuel or chemicals enzymatic hydrolysis offers an environmentally friendly option with potential for higher yields, selectivity, lower energy costs and milder operating conditions than employing a chemical process . The most common enzyme used for enzyme saccharification are cellulases, cellulases have the capacity to hydrolyse cellulose into glucose, cellulases are produced by fungi include the filamentous fungus Trichoderma reesei (teleomorph Hypocrea jecorina) [7, 8]. Furthermore, cellulase produced by T. reesei is a cocktail of enzymes which catalyses the reaction of water with cellulose with the end-product being glucose. Due to the complex nature of cellulose, enzymatic hydrolysis is influenced by both the structural features of cellulose and related factors such as enzyme source, thermal inactivation, activity balance for synergism, specific activity, nonspecific binding, and enzyme processibility/ compatibility. However, the mechanism of hydrolysis of cellulose is not fully understood due to the fact that lignocellulosic biomass is a multi-scale, complex and highly heterogeneous material. [7, 9, 10]. Pre-treatment could help to increase release of sugars from the substrate such as alkaline pre-treatment uses various alkaline reagents like NaOH , calcium hydroxide [12, 13], potassium hydroxide , or aqueous ammonia , Applying an alkali pre-treatment can remove lignin and uronic acid, which improves glucose recovery from cellulose [16, 17]. Biomass pre-treatment using an alkaline has advantages in utilising lower temperatures and pressure when compared with other pre-treatment strategies . Enzyme hydrolysis process is considered a promising method for the conversion of lignocellulosic cellulose into glucose. However, there are many factors which can affect the hydrolytic efficiency of the cellulosic substrate such as crystallinity of cellulose, the lignin content the lignocellulosic material, presence of heavy metals, degree of polymerization (DP), moisture content, and particle size . Furthermore, microbial contamination of the enzyme can affect the efficiency of the hydrolysis process [17, 19]. Research has focused on decreasing the adverse effects of these factors on the process, for example cellulose crystallinity, cellulose contains regions of crystallinity where parallel cellulose chains are tightly held together via hydrogen bonds, these crystalline sections have been shown to make cellulase less accessible to the hydrolytic enzymes; this observation could explain the observation that substrates with a high degree of crystallinity are more resistant to enzymatic degradation when compared to more amorphous substrates [20, 21]. Presence of lignin in the substrate could have a negative effect on hydrolysis . However, addition of surfactants have been reported to enhance cellulose hydrolysis [23, 24]. Adding surfactants has some advantages such as to prevent enzyme denaturation during agitation; and the presence of a surfactant could change the nature of the substrate (e.g.by removing inhibitory lignin) . Non-ionic surfactants can influence cellulose hydrolysis such as the fatty acid esters of sorbitanpolyethoxylates (Tween80, Tween20) and polyethylene glycol (PEG), these have been shown to enhance hydrolysis , addition of surfactants such as non-catalytic (bovine serum albumin BSA) has been observed to have similar additive effects on enzyme hydrolysis . The main objective of the present work is to optimize the efficient conversion of available lignocellulose present in MSW into fermentable sugars, such a step is key for efficient production of biofuel(s). Experiments will look into crystallinity, addition of antibiotics, optimal enzyme activity, presence of surfactants and optimal loading rates in order to determine the optimal conditions for the conversion of MSW into a media suitable for a biofuel fermentation. Municipal solid waste (MSW) was supplied by Wilson Company in the UK. The lignocellulosic composition, lignin, protein and lipids analyses of the substrate have been described previously . The method included pre preparing the sample for analysis including removal of organic materials by hydrogen peroxide, make sure the particle size is sieved and smaller than 2 mm, place 0.25-0.5 g of moist sediment into a 50 mL centrifuge tube, add 100 mL of H2O2 Wait for the initial fizzing to subside and then swirl the tube to see if any further reaction occurs. If so leave for 10 minutes and swirl again, heat in a water bath at 80°C for 2 hr or until all organic material has been removed, centrifuge at 3000 rpm (4690 g) for 3 minutes, discard the supernatant, add distilled water to the sediment, agitate the tubes in an ultrasonic bath to wash the grains, add 10% (v/v) Calgon (sodium hexametaphosphate and sodium bicarbonate) to the sediment and agitate in the ultrasonic bath. A broad particle size distribution within the laser-generated aerosols (up to 1 µm or even larger) was required to detect variations in concentration between different size fractions. To ensure such a particle size distribution, a NIST 610 glass standard reference material was ablated using a 266 nm (laser ablation system (LS 200, VSM+) operating in scanning mode. The ablation parameters for laser system was adjusted to 10 Hz and a scanning speed of 10 µm s?1. The largest possible crater sizes were chosen for generating as many particles as possible (0-75 um, 75-106 um, 106-250 um, 250-425 um, and 425-2000 um). The detailed operating conditions included: run length 30 mins, Optical model Fraunhofer.rfz, and Volume 100 ml. MSW crystalinity using X- ray diffraction to determine Crystallinity Index Assays and Calculations (CrI). The Wide-angle X-ray diffractogram of the MSW materials was measured using a Siemens S5000 system with a vertical theta-theta goiniometer, using powder reflection geometry, with Cu K? incident radiation (1.542 nm), with fixed detector slit. The raw diffraction curve was recorded from 5 to 50° 2?, at 0.05° resolution, which was then subjected to a linear baseline correction over these limits. Total biomass crystallinity was estimated by an amorphous subtraction procedure, according to equation (1) using an experimental profile of a highly ballmilled sample, where the amorphous intensity was adjusted so it just touched the sample profile in the region of 17° 2?. Estimation of biomass crystallinity was complicated by the presence of non-biomass related mineral diffraction peaks, from inorganic components of the municipal waste which were subtracted manually from the broader biomass profile. A further procedure was adopted where the main known cellulose diffraction peaks were fitted to the corrected sample profile by modelling by as Gaussian shapes. The combined integrals intensities of these peaks, from the , [0-10],  and  reflections represented the crystalline cellulose contribution. The modelled biomass crystallinity was then calculated using equation (2). An estimation of the lateral dimensions the cellulose fibrils in the cell walls of the biomass component of the MSW was determined using the Scherrer equation (equation 1), where L is the dimension corresponding to the cellulose-I  reflection, IB is the  integral breadth, following the curve fitting of this diffraction peak, ? is the X-ray wavelength (Cu K? = 1.542 nm) and ? is the diffraction angle of the  peak in radians. Following the NERL [27, 28] protocol 0.5 g MSW was mixed with 100 mL solutions (enzyme stock solution+ 0.05 mol L?1 citrate buffer, pH 4.8) with the ratio determined according to the enzyme activity of prepared stock solution, which for Ctec2 enzyme and the Sigma enzyme were 10.41 and 13.5 U/mL, respectively and crude enzyme 1.81 U/mL, respectively. The filter paper cellulase activity protocol  was used to assess enzyme activity over the period of purification. Enzyme-containing solution samples (0.5 mL) were mixed in the tubes with 0.5 mL of 50 mM citrate buffer (pH 4.8). Strips (1 × 6 cm, approximately 50 mg) of Whatman No. 1 paper (cellulose substrate) were placed in the tubes, and the tubes were incubated at 50°C for 1 hr. After that, 3 mL of dinitrosalicyclic (DNS) reagent (prepared according to  was added to each tube and the mixtures were boiled for 5 min and cooled on ice (5 min). Samples were diluted (0.2 mL of sample was mixed with 2.5 mL of distilled water) and absorption was read at 540 nm. Cellulase activity was determined by measuring the absorption of samples using a Jenway 7315 spectrophotometer, in this study two FPA (filter paper Assay) had 15 and 30 FPU/g of substrate added to, and incubated at 50°C, shaking incubator 150 rpm (HeraeusMegafuge 16 centrifuge, Thermo scientific) for 72 hr. Samples were taken at 0,4,6,24,48 and 72 hrs. time-points for sugar analysis especially glucose. Sugar content was determined by ion chromatography IC (Dionex ICS-300SP). Samples were taken at various time points (0, 4, 12, 24, 48 and 72 hrs). For the time-resolved hydrolysis experiments, glucose concentration curves were fitted to a single exponential growth function, described by equation (3), where Cf is the final concentration at the assymtote of the function, Ct is the concentration at time t, and k is a rate constant. Monosaccharides (arabinose, galactose, glucose and xylose) were determined using a Dionex ICS 300. Reagent free TM Ion chromatography equipped with the instrument system, electrochemical detection using ED 40 and computer controller. The caroPacTM PA 20 column (3 × 150 mm) was used and the mobile phase was 10 Mm NaOH with a flow rate of 0.5 mL/min, injection volume was 10 µL and the column temperature was 30°C. 2.4.1 Optimizing enzyme hydrolysis and decreasing sugar degradation over time by using sterilization and bacteriostatic agents: In order to prevent growth of potentially sugar utilising microorganisms 30 mg/0.5 gm antibiotics (tetracycline) and sodium azide (both supplied by Sigma Aldrich) were added to the substrate, as a control 30 FPU enzyme loading rate was used without any addition of antibiotics or sodium azide. The samples were incubated for 72 hrs at 50°C and 150 rpm, the total volume included 100 mL buffer citric acid buffer 0.05 N and enzyme with 0.5 gm MSW. The buffer and enzyme has been sterile too using syringe filter 0.45 µM Whatman filter paper. 2.4.2 Optimizing best enzyme and FPU (15, 30 and 60 FPU) using commercial or crude enzymes 0.5% MSW: Commercial enzymes CTec2 (Novozyme, Nottingham, UK) and cellulase (Sigma-Aldrich, C2730 - Cellulase from Trichoderma reesei ATCC 26921 designated as Sigma cellulase in this study) were used together with a crude fungal enzyme filtrate (extracted from culturing of T. reesei on MSW) for the hydrolysis of MSW. Cellic® CTec2 and Sigma cellulase were stored at 4°C until needed. Preparation of the crude fungal enzyme filtrate has been described previously . Spore suspensions of T. reesei was added to each bottle (1x106 spores per g of dry substrate, with 5:6.5 (60%) solid liquid ratio). After addition, the content of each bottle was mixed with a sterilised spatula for even distribution of inoculum and transferred onto two Petri dishes (2.5 g of original solid material per dish), then incubated in a static incubator at 30°C with incubation for 168 hrs, then the crude enzyme extracted to measure cellulase enzyme activity using filter paper cellulase activity protocol  (The optimised conditions selected from literature with the activity 1.34 U/mL). Cellic® CTec2 had a protein concentration of 141.6 mg protein/g as determined by a bicinchoninic acid (BCA) assay (Pierce, Rockford, Ill.) . Enzymatic hydrolysis of MSW was done by using only Ctec2 (Novozyme, Nottingham, UK), this enzyme has been shown previously to be the best enzyme for the release of sugar from MSW as mentioned in the previous experiment. Similar stock solution for Cellic® CTec2 with 10.41 U/mL activity were used and mixed with various 0.5% MSW) with various FPU/gm (15, 30 and 60 FPU/gm MSW). The experiment condition were as described above. 2.4.3 Alkaline pre-treatment of MSW: Various alkali concentrations (0.5, 1, 2, 4, 8 and 10% NaOH w/v) were prepared and 10% MSW (w/w) was added into the alkali solution. The pre-treatment was carried out at room temperature without shaking for 12 hrs, the solution was neutralized to pH 7.0 using 5 N H2SO4, centrifuged at 4690 for 5 mins. The solid was washed three times using distilled water and then dried in an oven at 105°C, for 24 hrs. 0.5 gm of dried alkali pre-treated sample was added to a 250 mL flask as described before for EH process, using 30 FPU. To evaluate the pre-treatment efficiency on enzymes hydrolysis performance, pre-treated MSW was hydrolyzed with an enzyme blend at 9.46 u/mL, then 1 mL of hydrolysate mixed with distilled water for analysis by Dionex for sugar (glucose) concentrations. 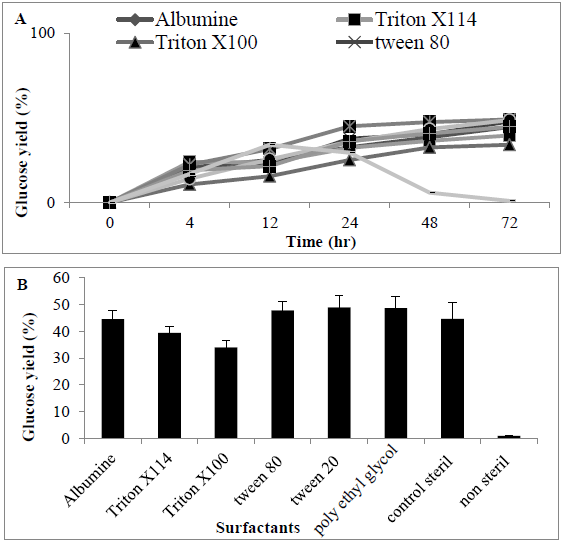 2.4.4 Impact of surfactant on enzymatic hydrolysis 0.5% MSW: Five surfactants were used to investigate the impact of surfactant on cellulase hydrolysis, these surfactants included Bovine Serum Albumin (BSA), Triton X-114 (1,1,3,3-Tetramethylbutyl)phenyl-polyethylene glycol, Polyethylene glycol tert-octylphenyl ether) TritonX-100 (4-(1,1,3,3-Tetramethylbutyl)phenyl-polyethyleneglycol, t-Octylphenoxy polyethoxyethanol, Polyethylene glycol), Tween 20 (poly(oxyethylene) 20 sorbitan-monolaurate Polyethylene glycol sorbitan monolaurate, Polyoxyethylenesorbitan monolaurate)and Tween 80 (poly(oxyethylene) 20- sorbitan-monooleate POE (20) sorbitan monooleate), Polyethylene glycol sorbitan monooleate, Polyoxyethylenesorbitan monooleate, Polysorbate 80 (Merck). These experiments were performed with commercial enzyme Cetic-2, using 30 FPU/0.5g MSW. 30 mg of each of the above mentioned surfactant was added to the hydrolysis system. For all experiments looking at optimising EH similar stock solution for Cellic® CTec2 with 10.41 U/mL activities were used and mixed with various solid liquid ratios (0.5, 2, 4 and 6% MSW) with 30 FPU/gm. The experiment condition was as described above and used the same methods. Acid hydrolysis applied to analysis most of the chemical content in terms of monomeric sugars (Glucose, Galactose, Xylose and Arabinose) (Table 1), Cellulose, and hemicellulose. Also determined some other compositions such as lignin, starch, lipid, and protein. The compositions results described by . Table 1: Monomeric sugars analysis. 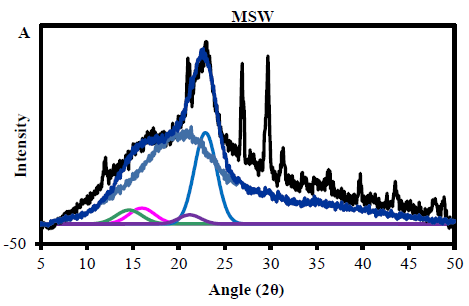 3.2.1 MSW cellulose crystallinity from X- ray diffraction: Determination of the absolute crystallinity of cellulose in the MSW materials was complicated by the presence of non-crystalline components of other organic material. From the chemical composition this would include lignin and hemicellulose, proteins, starch and other polysaccharides, either derived from plant tissue or from processed components of MSW. Also a number of mineral peaks were observed in the XRD profiles, with the strongest at 29° and 26.7° 2? assigned to calcium carbonate, which is often used as a filler in packaging and plastics. However, the diffractogram showed good evidence for the presence of the main crystalline peaks expected for the native cellulose-I allomorph, which could be fitted successfully as described in the methods section. From these integrals and the application of equation (1) the total organic crystallinity was found to be 17.8%. This is lower than typically expected for native lignocellulosic materials by the equivalent fitting method, such a wheat straw and woody materials, which may have experimental crystallinities around 23-25%. This indicates the presence of other non-crystalline material in MSW apart from the hemicellulose and lignin expected from the biomass cell wall. This is also clear from the relatively poor fit of wood derived amorphous profile to the MSW profile in the 2? range above 25°, as other non-crystalline material contributing to this broad underlying feature will most likely have a different shape and spread of intensities. The chemically determined cellulose content of the MSW is 27.8%, from which it is possible to estimate the crystallinity of the cellulose fraction, which is then 17.80.278 = 64%. This is consistent with crystallinities found for native cellulose in woody materials, where the majority of the non-crystalline fraction is due to imperfectly organised molecules at fibril surfaces. In addition an estimation of the average fibril lateral dimension can be established from the Scherrer equation (2), which gives a value of 2.7 nm for major  reflection. This is again typical for the fibrils in commercial woody materials, which are relatively thin compared to other sources of cellulose such as cotton or flax. Therefore from these XRD results it is reasonable to assume that the major cellulosic contribution to the MSW is from paper or card packaging or office waste (Figure 1A). Three different particle size fractions from MSW by the 266 nm laser under the atmosphere were collected, digested and analyzed separately. The first fraction contained the entire sample, while for the second fraction all particles above 75nm and for the third one all particles above 106 nm were removed by the particle separation device before filtering the remaining aerosol, then forth 425 nm, finally 2000 nm (Table 2). Table 2: Comparison of MSW and wheat straw particle size. The relative reduction of the transported particle Diff. volume% was also calculated from the particle size distributions to be 47.63% for 0-75 nm size cut off and 20.82% for 75-106 nm size cut off, 19.84% for 106-250 nm, 7.15 for 250-425 nm, and 4.52% for 428-2000 nm respectively (Figure 1B). Figure 1: (A) The MSW crystalinity using X- ray diffraction to determine Crystallinity Index Assays and Calculations (CrI) (B) particle size. MSW hydrolysis using Cellic® CTec2 was carried out at 50°C using a shaking incubator, it was observed that glucose concentration increased in the first 12 hrs of the hydrolysis but then dropped significantly thereafter (Figure 2). At the end of hydrolysis (72hrs), we failed to observe any glucose in the samples, and it was suspected that the hydrolysis experiment was microbial contaminated. Therefore, 30 mg of antibiotic (tetracycline) or chemical disinfectant (sodium azide) was added into the hydrolysis experiment, under these conditions glucose accumulated throughout the hydrolysis period and there was no step-wide reduction observed. Glucose concentrations reached a final concentration of 0.52 ± 0.03 and 0.50 ± 0.02 g/L (25.1 and 22.4%) in the presence of antibiotic or disinfectant, respectively. An alternative to the use of antibiotics or chemical means for controlling microbial contamination of samples would be a prior autoclaving of the MSW; we looked at the effect of autoclaving before enzymatic hydrolysis. 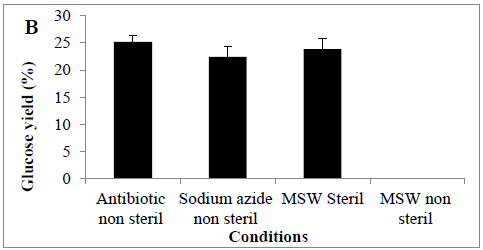 The amount of sugar released from autoclaved MSW during enzyme hydrolysis was (0.45 ± 0.09 g/L) (23.8%) (Figures 2 A and B), analysis revealed a significant difference between presence of tetracycline or sodium azide or autoclaving with non-sterile conditions in terms of conversion yields (P<0.0011). Figure 2: Amount of glucose (%) in a hydrolysate following an enzyme hydrolysis pre-treatment using four conditions (A) time course or (B) Barchart. Mean + SD (n=3). The impact of different enzyme on enzymatic hydrolysis of MSW was investigated. Two commercial cellulase enzymes: Cellic® CTec2, Sigma cellulase and a crude cellulase solution (a fungal filtration from solid state fermentation of T. reesei on MSW) were compared. Two loading rates: 15 and 30 U/g was examined using these enzymes. Results revealed that that use of higher enzyme loading rates do not led to a significantly higher glucose concentration. When comparing different hydrolytic enzymes, Cellic® CTec2, showed relatively highly hydrolysis capacity for MSW when compared with the other enzymes, as a consequence of this Cellic® CTec2, was taken forward for determining optimum conditions. Increasing loading rate to 60 FPU (0.52 ± 0.045 g/l) (31.2%) did not lead to a significant improvement in glucose liberation when compared with use of 30 FPU (0.50 ± 0.11 g/L) (32.26%). Under control conditions (no pre-treatment) sugar liberation was very low (0.09 ± 0.07 g/L) (4.9%) when compared with presence of a hydrolytic enzyme, indicating that pre-treatment is essential for the release of sugars from MSW. An assessment of enzyme saccharification revealed that CTec2 performed better than the cellulase enzyme from Sigma which is a pure cellulase enzyme compared with Cellic® CTec2CTec2 which has been shown to also contain ?-glucosidases [30, 31] (Figures 3 A and B) (P<0.0001). An assessment of enzyme saccharification revealed that Cellic® CTec2Ctec2 performed better than the cellulase enzyme from Sigma derived from Trichoderma and henceforth this enzyme was taken forward for assays to determine optimization of conditions (Table 3). Table 3: Comparison of MSW and wheat straw particle size. Figure 3: Amount of glucose (%) in hydrolysates following a pre-treatment of MSW using various enzymes Mean + SD (n=3) (A) Tine course (B) bar chart. In this study, enzyme hydrolysis of MSW using commercial cellulase enzyme cocktails (Cellic® CTec2 with cellulase obtained from sigma) with a crude enzyme preparation extracted from MSW was determined. The constant rate curves were fitted to the exponential growth model described by equation (3), from which rate constants and assymtote (Ci) sugar yields were determined, as summarized in Figure 4 A, B and C.
Figure 4: Amount of glucose (%) showing rate constant of 3 enzymes in a hydrolysate following a pre-treatment of MSW (A) Sigma (B) Celtic2 (C) MSW. Mean + SD (n=3). 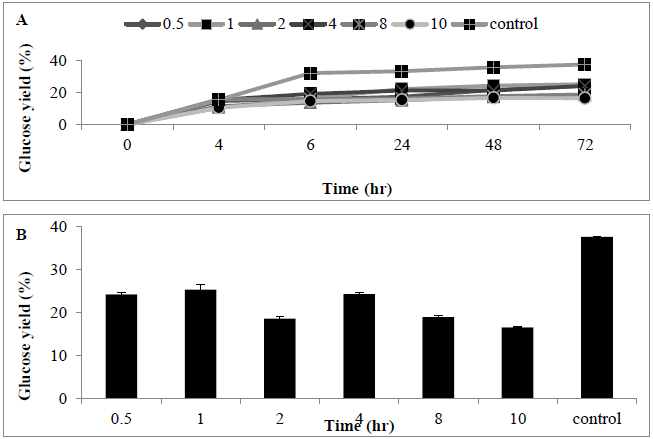 The effect of enzyme dosage on enzyme hydrolysis of MSW biomass was determined; the maximum glucose concentration was achieved with a cellulase loading of 30 U/g substrate. Analysis revealed that glucose concentration released using 15 and 30 FPU (0.04 ± 0.02 and 0.5 ± 0.09 g/L) (25.44 and 31.22%) was significantly different (p<0.0001) Assays using 60 FPU revealed a slight increase in glucose concentration (0.51 ± 0.09 g/L) (31.26%), however, the increase was not significantly better than with the use of 30 FPU (P<0.154) the glucose concentration increased slightly comparing with other applied conditions or loading rates such as 15 and 60 FPU (Figures 5 A and B) . Figure 5: Amount of glucose (%) following use of various enzyme loading rates for pre-treating MSW (A) time course, and (B) bar chart Mean + SD (n=3). Pre-treatment using alkaline substrate was conducted in order to improve the MSW hydrolysis efficiency, alkaline pre-treatment was carried out before cellulase enzymes were applied. A wide range of NaOH concentrations (0.5-10%) were utilized for the pre-treatment of MSW samples. After 72 hrs of enzymatic hydrolysis using the alkali pretreated MSW, use of NaOH was characterized by lower sugar release when compared with control experiments (no alkaline added). This indicates that use of an alkaline pre-treatment reduced the conversion of MSW into monomeric free sugar (Figures 6A and B). Figure 6: Amount of glucose (%) following use of sodium hidroxide (0.5-10%) for pre-treating MSW (A) time course, and (B) bar chart. Mean + SD (n=3). Release of sugars following addition of surfactants was determined with the highest release of sugars observed using tween 80 and PEG, respectively (0.85 ± 0.04 and 0.92 ± 0.092 g/L) (47.8 and 48.66%) when compared with other surfactants. When compared with controls (no surfactant added), there was a difference in release of sugars (0.85 ± 0.085 g/L) (44.67%) which was significantly different (P<0.0056) between surfactants (Figures 7A and 7B). Figure 7: Amount of Sugar (%) following using various surfactants for enzyme hydrolysate MSW (A) time course (B) barchart. The impact of substrate loading ratio on the enzymatic hydrolysis was investigated, using a standard cellulase enzyme loading rate (Ctec-2, 30 PFU/g), the increase of solid loading rates of MSW concentration (0.5-6% (w/v) led to a linear increase in glucose concentrations in the hydrolysate (Figures 8A and 8B). Loading above a 6% S/L led to the reaction system becoming too viscous for adequate stirring. Statistical analysis revealed a significant difference in S/L loading rates (P<0.0012), with sugar conversion decreasing as solid liquid ratio increased from 0.5 to 6%. 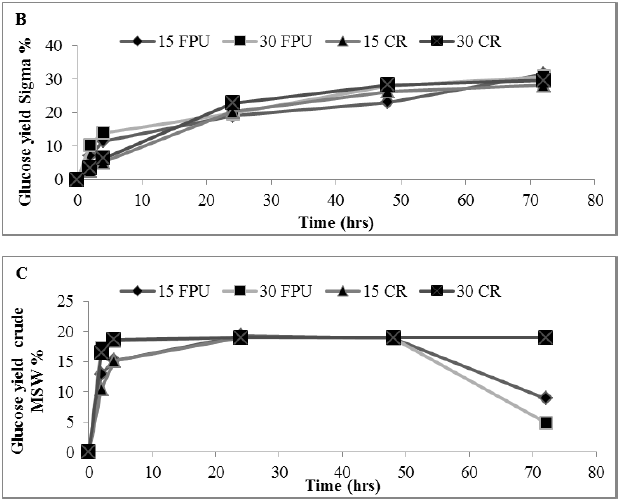 Figure 8: Amount of Sugar (%) following using two FPU for enzyme hydrolysate various solid liquid ratio of MSW (A) time course (B) barchart. Cellulose degradation to glucose by enzyme is generally accomplished by the synergistic action of at least three major classes of enzymes namely: endo-glucanase, exo-glucanases and ?- glucosidases, collectively these enzymes are termed cellulase or cellulolytic enzymes . Each of these enzymes has a different mechanism by which they break down cellulose polymers . However, there are other enzymes whose mechanisms are not well understood, but presence in the cocktail has been shown to increase activity . Generally, the hydrolysis process can be divided into two steps a primary (depolymarisation step) and secondary (hydrolysis of cellobiose to glucose), however, factors like the heterogeneous nature of lignocellulose make a complete understanding of hydrolysis difficult . Crystallinity of the MSW substrate could have an effect on the amount of sugar released from the substrate, this study is in agreement with  where substrate related factors such as biomass loading rate and crystallinity can affect the enzymatic hydrolysis of lignocellulosic material. There has been a correlation between enzymatic digestibility and structural factors such as lignin content, crystalinity, depolymarisation (DP), available accessible surface area, structural organisation, and acetyl content . Degree of crystallinity significantly affects initial hydrolysis rates but has less of an effect on overall yield of monomeric sugar [36, 37]. Research has revealed that that these parameters alone do not explain the recalcitrance of lignocellulosic substrates  agreeing with the data here which revealed that crystallinity had no effect on the enzyme hydrolysis process. To improve the efficiency of enzymatic hydrolysis of MSW, different anti-microbial conditions such as addition of antibiotics, sodium azide or autoclaving were assessed and use of these approaches had an effect of improving release of sugar when compared with no treatment. Data revealed that addition of antibiotics improved release of sugar when compared with addition of sodium azide and sterilisation; this maybe because antibiotics are substances produce by microorganisms, which inhibits growth of other microorganisms [38, 39]. There are many types of antibiotics can be used to keep enzyme stability over time, in this study tetracycline was used, is a broad ?spectrum polyketide antibiotic produced by the Streptomyces genus of Actinobacteria and it’s mode of action is by inhibiting protein synthesis , in terms of decreasing the cost of experiment sterilisation of substrate did not shows a vast difference when compared with addition of sodium azide or antibiotics. The most broadly cellulose degradation enzyme studied is cellulase enzyme cocktail produced by T. reesei (is well known as a cellulase-producing organism) due to the stability of the enzymes under the enzymatic hydrolysis conditions, and resistance of the enzyme to chemical inhibitions, while the main disadvantage of the cellulase produced by Trichoderma comparing with Aspergillus are suboptimal concentrations and low activity of ?- glucosidase . In this study, Cellic® CTec2 cellulase enzyme cocktail was better than Sigma for hydrolysing MSW, this effect might be as a result of Ctec” being a cocktail of various enzymes. Cellic CTec2 has been shown to be effective with a wide variety of pre-treated lignocellulosic materials for the conversion of the carbohydrates in these materials to simple sugars prior to fermentation, while the enzyme from Sigma is a homogenous cellulase enzyme, cellulase consists of long chain molecules, which is partially resistant to degradation and require several different enzymatic modes of attack to be effectively degraded at a reduced coast . In order for sugars to be converted into ethanol during a fermentation to be cost-effective a low operating cost is very important . In general, addition of initial cellulase was characterised by an increased rate of hydrolysis and yield, but addition of enzyme would have an adverse effect on operational costs if applied industrially. 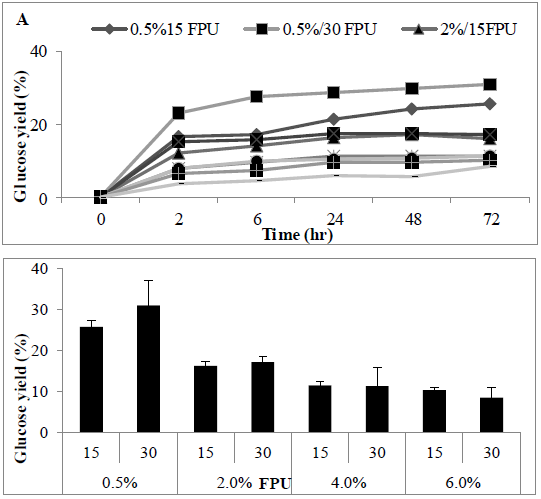 Previous work has shown that a cellulase loading rate of 5 to 35 FPU per gram of substrate was optimal  results in this study verified this data revealing that an enzyme loaning rate of 30 FPU was optimal. In the present study, addition of cellulase enzymes at dosage rates of 15 or 30 FPU/0.5 gm released sugars from MSW. Addition of above 30 FPU/0.5 gm appeared to correlate with a reduction in release of sugar agreeing with an observation where addition of 40 FPU also reduced conversion rates . Higher enzyme loading has been correlated with overcrowding cellulose chains thus reducing rates at which cellulose is hydrolysed . Pre-treatment step is considering as a necessary step to alter some lignocellulosic characteristics for increasing glucan and xylan accessibility to the enzyme attack. Selecting type of pre-treatment and subsequent step has a great effect on the enzymatic hydrolysis . Furthermore, selecting a specific pre-treatment for a particular raw material to increase biomass digestibility depends on several factors such as the combination of composition of the substrate, type of pretreatment and dosage and efficiency of the enzyme used for the hydrolysis although the individual impacts of these factors on the enzymatic hydrolysis are still unclear . Therefore, alkaline pre-treatment can play a significant role in exposing the cellulose to enzyme hydrolysis . The previous study did not agree with the present study, due to the low severity of the alkaline pre-treatment little sugar decomposition occurs and hemicellulose is retained in the biomass, the method can remove acetyl and various uronic acid substitutions in hemicellulose can lower enzyme accessibility [14, 47]. Furthermore a study indicated that the hydrolysis rate can be drop with particle size above 300 lm is explained by the longer diffusion of enzyme into the fibre particles . This suggests that extensive milling is not needed for the conversion of the organic MSW concentrate. The low glucose yield could be ascribed to the low lignin content of these MSW samples, as alkali pre-treatments have been shown to work more efficiently with lignocellulosic materials which have high lignin content . Results here correlated with published observations reporting that use of an alkali pre-treatment led to a reduction in production of sugars . However, pre-treatment with dilute NaOH has been reported to enhance production of sugars from LCMs , differences with this study was the degree of washing of the samples, as washing has been shown to reduce glucose concentrations [51, 52] or the particulate size where small particulate size has been shown to enhance xylan or glucan conversion rates [53, 54]. In this study, increasing alkaline concentrations led to a reduction in release of sugars from MSW, however, studies have shown that by increasing the concentration of alkaline (6-20% NaOH) there is an increase in biomass delignification which results in cellulose dissolution and reduced lignin removal [11, 55]. During enzymatic hydrolysis, cellulases tend to irreversibly bind to lignin through hydrophobic interactions causing a loss in enzyme activity with the amount and composition of lignin affecting the formation of soluble sugars during enzymatic hydrolysis . To decrease the effects of the presence of lignin adding surfactant can show a positive effect on enzymatic hydrolysis by increase hydrolysis efficiency significantly, allowing for either a faster hydrolysis rate or lower enzyme dosage, also the addition of surfactants facilitates efficient recycling of cellulases after saccharification, a process step that ideally needs to be considered to reduce the cost of lignocellulosic ethanol production lignocellulosic ethanol production . Surfactants used tended to be amphiphilic compounds that contain a hydrophilic head and a hydrophobic C tail. They are capable of self-assembling into micelles and adsorb onto surfaces depending on the surfactant structure and the polarity of the surface . The main advantage of addition of a surfactant is to cause a surface structural modification or disruption of the lignocellulose that increases accessibility of the enzyme to cellulose, or addition may affect enzyme-substrate interaction by preventing nonproductive adsorption of enzymes, may act as enzyme stabilizers. Furthermore, they adsorb at the air-liquid interface and thus prevent enzyme denaturation during agitation in the hydrolysis mixture [24, 57]. The reason behind adverse effects of lignin on action of cellulases on lignocellulose is due to ability to adsorb enzymes, which make the access of cellulase enzymes to cellulose difficult [7, 58]; limits the rate of enzymatic hydrolysis by acting as a physical barrier; and preventing the digestible parts of the substrate to be hydrolyzed. In the present study, adding surfactant showed an improvement in release of sugars, the primary mechanism behind the increased hydrolysis efficiency by adding surfactant is due to the hydrophobic interaction between lignin surfaces and surfactants. Based on kinetic analysis, surfactants could promote the availability of reaction sites through surface disruption, in turn increasing the hydrolysis rate . A number of surfactant were examined for their ability to improve enzymatic hydrolysis including non-ionic surfactants such as fatty acid esters of sorbitanpolyethoxylates (tween80, tween20) and polyethylene glycol (PEG); addition of these have been shown previously to enhance enzymatic hydrolysis , \ or addition of non-catalytic proteins such as bovine serum albumin (BSA), BSA has been shown to adsorb to surfaces, reducing unspecific binding by “filling up” adsorption sites on lignin surfaces [7, 60, 61]. The main factors that affect enzymatic hydrolysis of lignocellulosic materials are substrate concentration and quality, pre-treatment method, cellulose activity, and hydrolysis conditions such as pH and mixing [43, 62]. In this study, low solid loading rate was examined for effect on enzyme hydrolysis and a S/L ratio of 6% w/v substantially increased final glucose concentration. However, use of high solid to liquid ratios can cause problems in mixing and mass transfer  In theory, higher sugar concentration translates into higher ethanol concentrations, which leads to reduce energy and cost [62, 64], however, increasing the solid/liquid ration makes effective mixing increasingly difficult. Furthermore, at high solids loading a major challenge is lack of liquid in the reactor, as water is essential for the effective hydrolysis [62, 65]. Studies have shown that conversion of cellulose decreases as solid/liquid ratios increased, however, these results differed from the data observed in this study [62, 66-68]. Generally, sugar concentrations was correlated with biomass composition density, indicating that the total sugar content in the biomass is not the primary contributing factor for sugar availability in untreated biomass . In this work, we have demonstrated the feasibility of MSW as feedstock for production of fermentable sugars using enzyme hydrolysis method. Substrate and buffer with enzyme sterilization showed bester performance comparing with the other conditions, and selected as a cheapest way to prevent microbial growth, C-tec-2 and 30FPU released more sugar comparing with other enzymes and enzyme loading rate, also enzymatic hydrolysis is most effective when a mixture, or cocktail of different cellulolytic enzymes are used; the majority of sugar released from cellulose is glucose. Alkaline pre-treatment and surfactant addition applied to increase the sugar yield, The alkaline pre-treatment did not show any improvement in terms of sugar releasing, while surfactants such as tween 80 and PEG showed better performance comparing with other surfactants, but still did not show significant increase in the amount of sugar comparing with non-addition condition, finally by increasing the S/L ratio, the amount of fermentable sugars increase. The optimal conditions identified here could be applied for the efficient conversion of available sugars into ethanol or other desirable products. The authors gratefully acknowledge the financial support by the Salahaddin university Iraq-Kurdistan region for funding this research. We also thank the Biotechnology of biological science research council (BBSRC) sustainable Bioenergy center (BSBEC) for supporting this research. Limayem A, Ricke SC, Lignocellulosic biomass for bioethanol production: current perspectives, potential issues and future prospects. Progress in Energy and Combustion Science 38 (2012): 449-467. Tomás?Pejó E, et al. Comparison of SHF and SSF processes from steam?exploded wheat straw for ethanol production by xylose?fermenting and robust glucose?fermenting Saccharomyces cerevisiae strains. Biotechnology and Bioengineering 100 (2008): 1122-1131. Yang, B, et al, Enzymatic hydrolysis of cellulosic biomass. Biofuels 2 (2011): 421-449. Hamelinck CN, Van Hooijdonk G, Faaij AP. Ethanol from lignocellulosic biomass: techno-economic performance in short- middle-and long-term. Biomass and bioenergy 28 (2005): 384-410. Scheper T, Faurie R, Thommel J. Advances in Biochemical Engineering/Biotechnology. Advances in Biochemical Engineering Biotechnology 109 (2008). Lee H, Hamid S, Zain S. Conversion of lignocellulosic biomass to nanocellulose: structure and chemical process. The Scientific World Journal (2014). Binod P. Hydrolysis of lignocellulosic biomass for bioethanol production Biofuels: alternative feedstocks and conversion processes (2011): 229-250. Singhania RR, et al. Advancement and comparative profiles in the production technologies using solid-state and submerged fermentation for microbial cellulases. Enzyme and Microbial Technology 46 (2010): 541-549. Himmel ME, et al. Microbial enzyme systems for biomass conversion: emerging paradigms. Biofuels 1 (2010): 323-341. Meng X, Ragauskas AJ. Recent advances in understanding the role of cellulose accessibility in enzymatic hydrolysis of lignocellulosic substrates. Current opinion in biotechnology 27 (2014): 150-158. Silverstein RA, et al. A comparison of chemical pretreatment methods for improving saccharification of cotton stalks. Bioresource Technology 98 (2007): 3000-3011. Chang, VS, et al. Simultaneous saccharification and fermentation of lime-treated biomass. Biotechnology letters 23 (2001): 1327-1333. Kaar WE, Holtzapple MT. Using lime pretreatment to facilitate the enzymic hydrolysis of corn stover. Biomass and bioenergy 18 (2000): 189-199. Chang VS, Holtzapple MT. Fundamental factors affecting biomass enzymatic reactivity in Twenty-First Symposium on Biotechnology for Fuels and Chemicals 2000 Springer. Kim TH, et al. Pretreatment of corn stover by aqueous ammonia. Bioresource Technology 90 (2003): 39-47. Li Y, et al. Enzymatic hydrolysis of corn stover pretreated by combined dilute alkaline treatment and homogenization Transactions. American Society of Agricultural Engineers 47 (2004): 821-826. Chang CC, et al. Activity of cellulase from Thermoactinomycetes and Bacillus spp isolated from Brassica waste compost. Scientia Agricola 66 (2009): 304-308. Alvira P, et al. Pretreatment technologies for an efficient bioethanol production process based on enzymatic hydrolysis: a review. Bioresource Technology 101 (2010): 4851-4861. Gregg DJ, Saddler JN. Factors affecting cellulose hydrolysis and the potential of enzyme recycle to enhance the efficiency of an integrated wood to ethanol process. Biotechnology and Bioengineering 51 (1996): 375-383. Fan L, Lee YH, Beardmore DH. Mechanism of the enzymatic hydrolysis of cellulose: effects of major structural features of cellulose on enzymatic hydrolysis. Biotechnology and Bioengineering 22 (1980): 177-199. Viikari L, Vehmaanperä J, Koivula A. Lignocellulosic ethanol: from science to industry. Biomass and bioenergy 46 (2012): 13-24. Li H, et al. Investigation of lignin deposition on cellulose during hydrothermal pretreatment, its effect on cellulose hydrolysis, and underlying mechanisms. Biotechnology and Bioengineering 111 (2014): 485-492. Zhou Y, et al. Non-ionic surfactants do not consistently improve the enzymatic hydrolysis of pure cellulose. Bioresource Technology (2015). Eriksson T, Börjesson J, Tjerneld F. Mechanism of surfactant effect in enzymatic hydrolysis of lignocellulose. Enzyme and Microbial Technology 31 (2002): 353-364. Rosen MJ, Kunjappu JT. Surfactants and interfacial phenomena. John Wiley a Sons (2012). Abdullah J, et al. Optimizing Cellulase Production from Municipal Solid Waste (MSW) using Solid State Fermentation (SSF). J Fundam Renew Energy Appl 6 (2016): 206. Ghose T. Measurement of cellulase activities. Pure and applied Chemistry 59 (1987): 257-268. Adney B, Baker J. Measurement of cellulase activities. Laboratory analytical procedure 6 (1996). Walker JM. The bicinchoninic acid (BCA) Assay for protein quantitation. The Protein Protocols Handbook 2009, Springer (2009): 11-15. Merino ST, Cherry J. Progress and challenges in enzyme development for biomass utilization, in Biofuels 2007, Springer (2007): 95-120. Harris PV, et al. Stimulation of lignocellulosic biomass hydrolysis by proteins of glycoside hydrolase family 61: structure and function of a large, enigmatic family. Biochemistry 49 (2010): 3305-3316. Wyman C. Handbook on bioethanol: production and utilization 1996: CRC press. Aro N, Pakula T, Penttilä M. Transcriptional regulation of plant cell wall degradation by filamentous fungi. FEMS microbiology reviews 29 (2005): 719-739. King BC, et al. An optimized microplate assay system for quantitative evaluation of plant cell wall?degrading enzyme activity of fungal culture extracts. Biotechnology and Bioengineering 102 (2009): 1033-1044. Zhao X, Zhang L, Liu D. Biomass recalcitrance Part I: the chemical compositions and physical structures affecting the enzymatic hydrolysis of lignocellulose. Biofuels, Bioproducts and Biorefining 6 (2012): 465-482. Kim S, Holtzapple MT. Effect of structural features on enzyme digestibility of corn stover. Bioresource Technology 97 (2006): 583-591. Pandey A. Biofuels: alternative feedstocks and conversion processes 2011: Academic Press. Szczepanowski R, et al. Detection of 140 clinically relevant antibiotic-resistance genes in the plasmid metagenome of wastewater treatment plant bacteria showing reduced susceptibility to selected antibiotics. Microbiology 155 (2009): 2306-2319. Giguère S, Prescott JF, Dowling PM. Antimicrobial therapy in veterinary medicine 2013: John Wiley & Sons (2013). Marzo A, Dal Bo L. Chromatography as an analytical tool for selected antibiotic classes: a reappraisal addressed to pharmacokinetic applications. Journal of Chromatography A 812 (1998): 17-34. Ortega N, Busto D, Perez-Mateos M. Kinetics of cellulose saccharification by Trichoderma reesei cellulases. International biodeterioration & biodegradation 47 (2001): 7-14. Modenbach AA, Nokes SE. The use of high?solids loadings in biomass pretreatment?a review. Biotechnology and Bioengineering 109 (2012): 1430-1442. Taherzadeh MJ, Karimi K. Enzymatic-based hydrolysis processes for ethanol. BioResources 2 (2007): 707-738. Xue Y, et al. Split addition of enzymes in enzymatic hydrolysis at high solids concentration to increase sugar concentration for bioethanol production. Journal of Industrial and Engineering Chemistry 18 (2012): 707-714. Olsen SN, et al. Kinetics of enzymatic high-solid hydrolysis of lignocellulosic biomass studied by calorimetry. Applied biochemistry and biotechnology 163 (2011): 626-635. Kumar R, et al. Physical and chemical characterizations of corn stover and poplar solids resulting from leading pretreatment technologies. Bioresource Technology 100 (2009): 3948-3962. Zhu Y, Lee Y, Elander RT. Optimization of dilute-acid pretreatment of corn stover using a high-solids percolation reactor in Twenty-Sixth Symposium on Biotechnology for Fuels and Chemicals, Springer (2005). Li S, Zhang X, Andresen JM. Production of fermentable sugars from enzymatic hydrolysis of pretreated municipal solid waste after autoclave process. Fuel 92 (2012): 84-88. Tutt M, Kikas T, Olt J. Influence of different pretreatment methods on bioethanol production from wheat straw. Agronomy Research 10 (2012): 209-276. Azizul HM, et al. Effect of dilute alkali on structural features and enzymatic hydrolysis of barley straw (Hordeum vulgare) at boiling temperature with low residence time. Journal of microbiology and biotechnology 22 (2012): 1681-1691. Chou Y-CT. Supercritical ammonia treatment of lignocellulosic materials 1987, Google Patents. Weimer P, et al. Effect of supercritical ammonia on the physical and chemical structure of ground wood in Biotechnol Bioeng Symp;(United States) 1986 EI du Pont de Nemours and Co Inc, Wilmington, DE 19898, USA Central Research and Developent Dept. Chundawat SP, Venkatesh B, Dale BE. Effect of particle size based separation of milled corn stover on AFEX pretreatment and enzymatic digestibility. Biotechnology and Bioengineering 96 (2007): 219-231. Elshafei, AM, et al. The saccharification of corn stover by cellulase from Penicillium funiculosum. Bioresource Technology 35 (1991): 73-80. Mirahmadi K, et al. Alkaline pretreatment of spruce and birch to improve bioethanol and biogas production. BioResources 5 (2010): 928-938. Helle SS, Duff SJ, Cooper DG. Effect of surfactants on cellulose hydrolysis. Biotechnology and Bioengineering 42 (1993): 611-617. Kim M, et al. Surface deactivation of cellulase and its prevention. Enzyme and Microbial Technology 4 (1982): 99-103. Mansfield SD, Mooney C, Saddler JN. Substrate and enzyme characteristics that limit cellulose hydrolysis. Biotechnology progress 15 (1999): 804-816. Kaar WE, Holtzapple MT. Benefits from Tween during enzymic hydrolysis of corn stover. Biotechnology and Bioengineering 59 (1998): 419-427. Börjesson J, et al. Effect of poly (ethylene glycol) on enzymatic hydrolysis and adsorption of cellulase enzymes to pretreated lignocellulose. Enzyme and Microbial Technology 41 (2007): 186-195. Pan X, et al. Strategies to enhance the enzymatic hydrolysis of pretreated softwood with high residual lignin.content in Twenty-Sixth Symposium on Biotechnology for Fuels and Chemicals 2005 Springer. Kristensen JB, Felby C, Jørgensen H. Yield-determining factors in high-solids enzymatic hydrolysis of lignocellulose. Biotechnology for Biofuels 2 (2009): 11. Sun Y, Cheng J. Hydrolysis of lignocellulosic materials for ethanol production: a review. Bioresource Technology 83 (2002): 1-11. Humbird D, et al. Economic impact of total solids loading on enzymatic hydrolysis of dilute acid pretreated corn stover. Biotechnology progress 26 (2010): 1245-1251. Hodge DB, et al. Model-based fed-batch for high-solids enzymatic cellulose hydrolysis. Applied biochemistry and biotechnology 152 (2009): 88-107. Cara C, et al. Influence of solid loading on enzymatic hydrolysis of steam exploded or liquid hot water pretreated olive tree biomass. Process Biochemistry 42 (2007): 1003-1009. Jørgensen H, et al. Liquefaction of lignocellulose at high?solids concentrations. Biotechnology and Bioengineering 96 (2007): 862-870. Ingram T, et al. Comparison of different pretreatment methods for lignocellulosic materials Part I: Conversion of rye straw to valuable products. Bioresource Technology 102 (2011): 5221-5228. Serapiglia MJ, et al. Enzymatic saccharification of shrub willow genotypes with differing biomass composition for biofuel production. Frontiers in plant science (2013): 4.